…And the quality just keeps on coming. Hero 7 and Mash & Munkee have a dancefloor breaks battle amongst themselves on this fresh little slice of wax b-boy action. It’s not just your ordinary A vs. B face off though. Nope – to change things up each pair has handed over their funky little baby to other for a reworking. Now there’s trust. It’s tricky deciding who’s got the bigger breaks but in the dancefloor stampede that dropping either of these will occasion it’s a moot point since when these beats are bumpin’ the crowd will most definitely be jumping. I hope my wax arrives in time for Friday’s gig. Yeah, I did say wax – I guess I’m just not ready to be a digital b-boy quite yet. 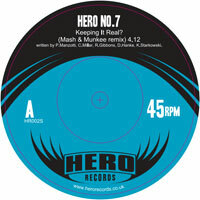 (PRESS RELEASE) Hero 7 return on their own Hero Records imprint with a brand new remixof ‘Keeping It Real’ by Germany’s breaks superstars Mash & Munkee. The original version of ‘Keeping it Real’ was a bona-fide b-boy classic, gathering support from top international djs such as Coldcut and Andy Smith and was featured alongside Eric B & Rakim, The Roots and The Herbaliser’s ‘FabricLive 26’ mix cd. It was also used by champion breakdancers the Bad Taste Cru when they represented the UK at the 2008 Battle Of The Year world finals. This remix fro 2011 sees Mash & Munkee (aka Unifairfly/ Renegades Of Jazz and Deli Kutts) trn the notch up and take the track into nufunk territory with new drums, guitars fat horns and swift scratching. In a remix exchange, Hero 7 have in turn reworked Mash & Munkee’s track ‘Kep O Movin’ and turned it into a cut n paste extravaganza, stripping back the original track to its musical roots and topping it off with heavier breaks, percussion and vocal samples. 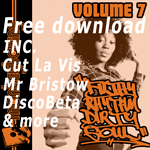 The track is topped off with some deft turntable action from legendary scratch DJ Krash Slaughta (IIT Tone Committee/ Monkey Mafia/ Killa Instinct) who expertly cuts up more musical delights.